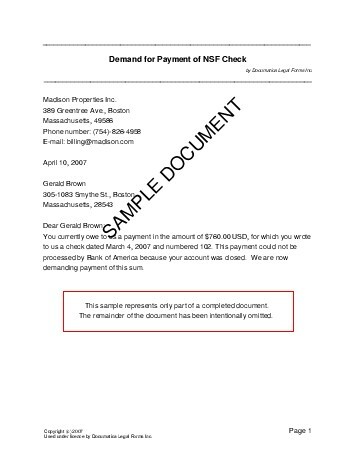 This document is used to demand the payment of sums that were paid by a check which was associated with a closed bank account, or an account with insufficient funds. If legal action is later initiated to recover the money, this demand letter can serve as evidence in court that the debtor has not attempted to resolve the matter. 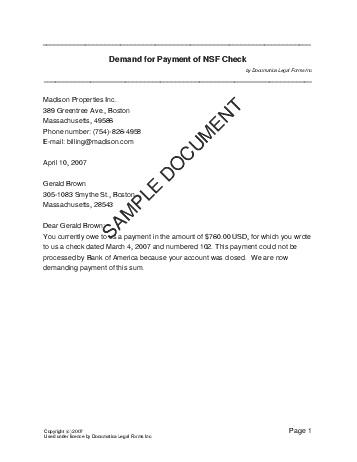 We strongly recommend obtaining an attorney reviewed Demand for Payment of NSF Check directly from us. Below are some random samples we have created with Documatica. Please note that these documents reflect a certain set of answers, and it is very likely that the document you require is different. Do not rely on the templates below - create your own customized Demand for Payment of NSF Check with our webpage. For maximum legal protection, obtain a lawyer reviewed Demand for Payment of NSF Check directly from us.